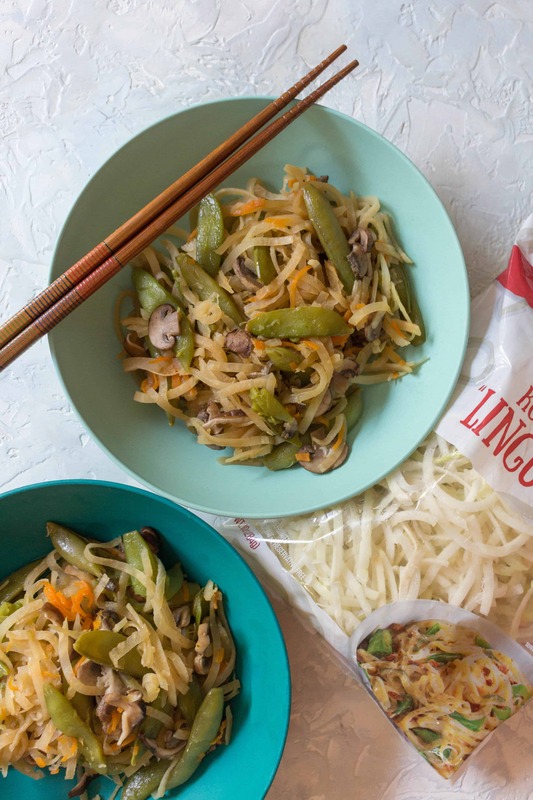 Craving a delicious lo mein but want to cut back on the carbs? Try this delicious low carb lo mein made with kohlrabi noodles made in under 10 minutes in an Instant Pot! Disclaimer: this recipe was created in partnership with Mann’s Fresh Vegetables. All opinions are my own, thank you for supporting the brands who make this blog possible! I looooove a good lo mein! There’s just something about getting a plate of it at dim sum that really hits the spot on Sunday mornings. This dish is so versatile – you can add chicken, you can add beef, you can change up the vegetables, or in my case here, make it low carb! When I got a bag of Kohlrabi “Linguine”, I was very excited to see what I could make with it. My first thought was lo mein in my Instant Pot! So what is Kohlrabi “Linguine”? Well Kohlrabi “Linguine” is a low-calorie and gluten-free pasta substitute made out of a “turnip cabbage.” Kohlrabi is a biennial vegetable and can be eaten raw as well as cooked. 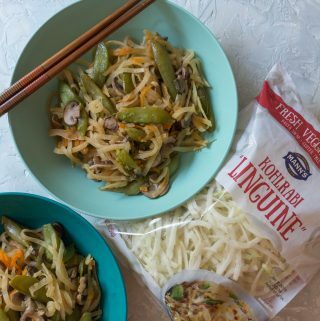 Using the kohlrabi in place of the noodles in this lo mein recipe is a delicious way to make your you hit your daily vegetable quota as well! This lo mein is refreshing and is the perfect lunch for when you’re craving something starchy but want to keep it light! When everything is done cooking, there will be some leftover liquid at the bottom. You can either drain the liquid or you can turn the liquid into a thicker sauce to coat your “lo mein” with by adding cornstarch to the liquid. If you want to add meat to this, such as chicken, I’d suggest dicing up your raw chicken into very small chunks before adding it to the bottom – under the Kohlrabi with the liquid. My rule of thumb is always at least 6 minutes under pressure per lb of chicken. 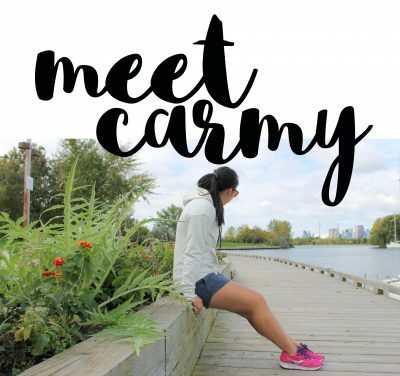 Craving a delicious lo mein but want to cut back on the carbs? 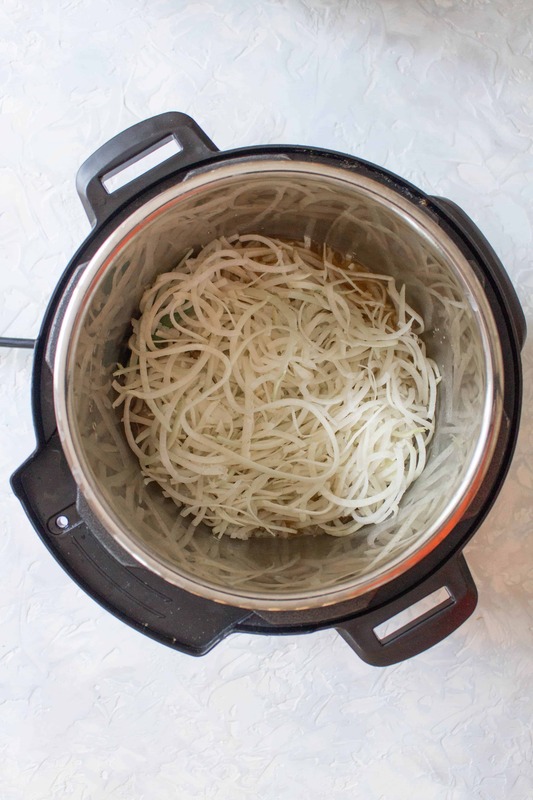 Try this delicious low carb lo mein made with kohlrabi noodles made under 10 minutes in an Instant Pot! On sauté mode in your Instant Pot, add olive oil and sauté your onion and garlic. After a minute or so, add in your lemon juice from a whole lemon, soy sauce, vegetable broth, and brown sugar and stir. 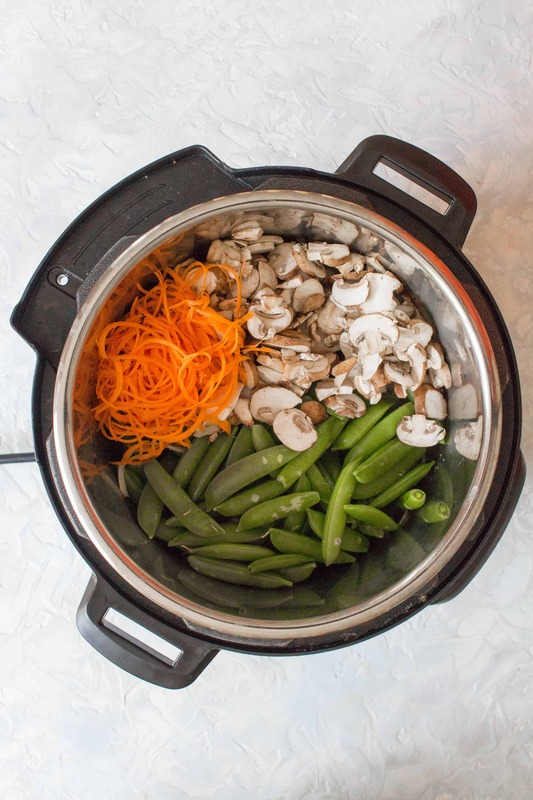 Once combined, add your Kohlrabi Linguine, Stringless Sugar Snap Peas, sliced mushroom, and carrot to your Instant Pot. Turn your valve to sealing and set your Instant Pot on high pressure for 5 minutes. Once done, give everything a good mix and serve. Hey, where did you find the kohlrabi linguini? I see on Mann’s website a list of stores but I can’t say I’ve ever seen these in Metro or No Frills! Hi Kiara! Did you try store locator? https://www.veggiesmadeeasy.com/find-a-store/ If I recall correctly, this is a relatively new product so it might still be rolling out! Where are you located? If the store locator link is of no help, let me know and I’ll see if I can find out some more info! It is indeed of no help! Doesn’t list which products are available where. I think most stores only carry their traditional frozen vegetables. I was just told that they’re not in wide distribution yet but hopefully will be soon. And an option is to request them from the produce manager at your local store! We are gluten free so I will be on the lookout for these noodles. 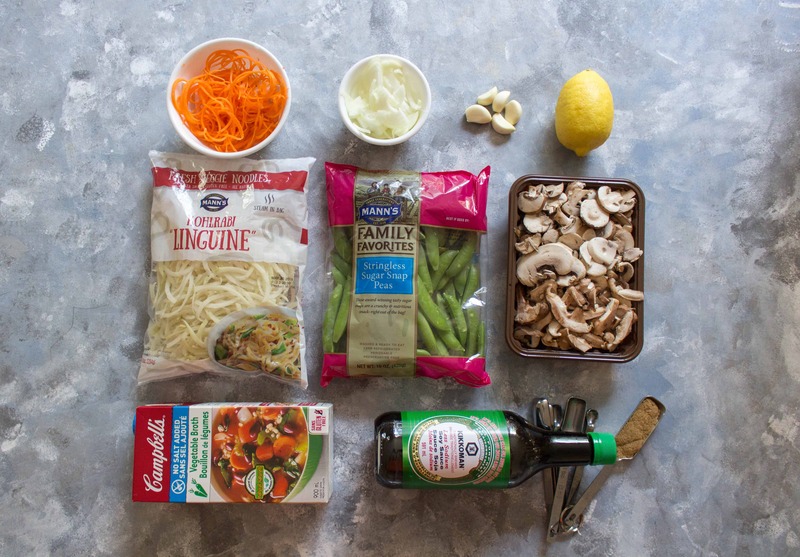 This recipe looks delicious and my entire family will love this lo mein. Thank you for the video too. This looks so scrumptious, though. Great question – the kohlrabi noodles are indeed substantial! I felt the same level of fullness if I was to have had regular lo mein! I really like the sounds of this dish! It sounds amazing. Now, I don’t have an Insta-Pot but I figure I can take your recipe and adapt it. We do like kohlrabi so I’m certain we’ll like them as noodles. Can’t wait to give this a go!! Oh I love the idea of this kohlrabi linguine, I have never noticed it before, I will have to keep an eye out! I guess I could always spiralize the kohlrabi myself, but that takes so much more time and I am all about the quick and easy these days. 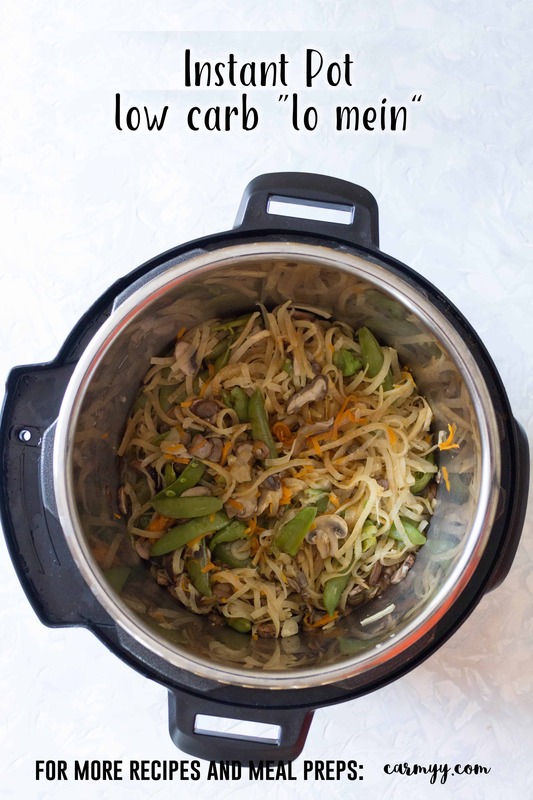 Hence loving the fact that this is also made in the instant pot – win! 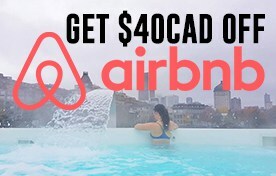 yaaaaaas! I am obsessed with kohlrabi and it’s so awesome to see it in pre-bagged spiralized form! Lo Mein is a fave of mine too, I’m going to have to make this soon – I hope I can find the kohlrabi, but if not, I’ll have to get out the ol’ spiralizer.